What impressed me most over all those years and again most recently on a trip to Australia is the consistency in SIA’s premium product offering. Both in on-board service and hardware one can always expect top standard, SIA excels in delivering a constantly high level on every single flight, not least because the tough drill of its crews. That might be quite predictable, sometimes a little robotic or even a hint boring, one is rarely surprised, but that’s what most passengers prefer on a long haul trip. It’s a bit puzzling, even for loyal customers, how often SIA launches product innovations, especially in recent times there were constantly launches of new or revamped cabins: From the A350 and a new Premium Economy to the new A380 with its celebrated swivel-chair-and-bed Suites (standing in for First Class) as well as an upgraded Business Class, and most recently of the first Boeing 787-10s with the premiere of a new regional Business Class. I tried out both. Currently SIA operates three of five new, re-ordered A380s, of which the first was delivered almost exactly ten years after the type’s first commercial flight in 2007. Its new cabin standard will be retrofitted into SIA’s 14 remaining older A380s until 2020. 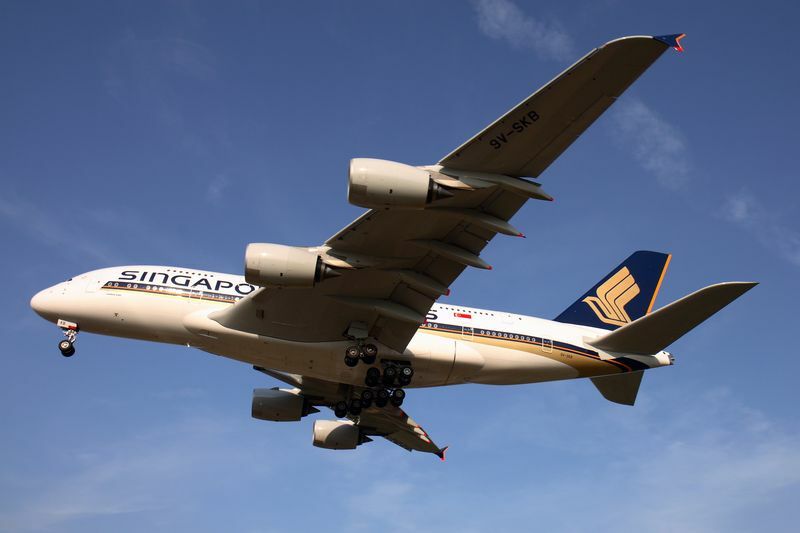 The new A380s currently fly on specific flights from Singapore to London, Sydney and Hong Kong. In March 2018 SIA received its first of currently five Boeing 787-10s for regional routes, these are operating certain flights from Singapore to Perth, Osaka and from July 2 also to Bali. I have flown in both new cabins on short night flights between Singapore and Australia, so I am concentrating here on describing the seats, as lounges or in-flight catering haven’t changed and I neither ate nor used the IFE on these red-eye flights. My evening flight from Singapore to Sydney is operated by the A380 registered 9V-SKV which was only delivered in February 2018. It uses the upper deck purely for the premium classes. In front there are six (formerly twelve) Suites, which were installed in front of the main deck before. Right behind there are 78 new Business Class seats, divided into a bigger cabin in front and a smaller one aft. In one of the earlier A380 layouts the whole upper deck is occupied by a total of 86 Business Class seats, showing how much denser the updated version is. The newly configured 19 A380s will boast 14% more Business Class seats in 2020 than SIA’s original A380 fleet. On first sight the new Business compartments in the A380 look much more elegant than before, thanks mostly to the flowing forms of their separations and their colours (aubergine and copper) – as well as the appealing mood-lighting when entering in outside darkness. Some major points of criticism many passengers had with the old seats have been rectified: So far seats had a modest pitch but where hugely wide in their 1-2-1 arrangement, almost bench-like at 30’’ (76cm), many users weren’t able to comfortably sit upright in them, in spite of being given extra pillows. The new cubicles now boast a mounted sideboard table besides them, creating an agreeable seat width of 25’’. One major complaint, however, wasn’t rectified: As the seat pitch has been reduced further (now only 50’’ instead of 55’’ before, 127cm instead of 140cm), the need to sleep diagonally still exists. And there is a new major issue now: The foot space is extremely tight, I almost couldn’t believe it at first. Up until now the rule was in all SIA’s Business cabins in all long-haul aircraft: Most foot space and the chance to sleep lying straight and not diagonally were only offered by the middle seats behind the bulkheads. In the new A380 these are seats D and F in rows 11, 91 and 96. I am sitting in 96K behind the door. Here, my carry-on trolley fits underneath the foot space (and not into the overhead locker), but the foot space is only a third of what the neighbouring seats 96D and F offer. As there is an empty one here, luckily, I move over to 96F. Here I have the whole seat width of 25’’ also as foot space, excellent. Almost shocking then is the situation in most other seats, I examine 97F behind me and measure the foot space, which is only a quarter of that in my bulkhead row. With shoe size 46 (12 in American size) I can’t even put my feet upright in it. But there is also one important improvement: The seat can be seamlessly converted into a bed by the passenger. This sounds like a no-brainer, but it wasn’t at SIA so far. Here a flight attendant had to come (repeat customers do it themselves), flip over the back part of the seat and create a bed. Still offered now are a mattress-like seat cover, a nice light blanket and two pillows. The bed itself, even with the padding, remains surprisingly hard, as is the seat pan without cover. Fully extended bed length is 198cm, same in the new as in the old product. If a tall passenger sleeps well in it or not mainly depends if he or she manages to secure one of the coveted seats with more foot space. How scarce it is on average borders on an insult. This can’t be overlooked even with positive news such as new free Wifi, 30MB in Business Class per sector, which usually is used up in minutes, depending on what it is used for. Or the interactive high-resolution flight map on the huge screen. Thanks to my lavishly spacious bed in 96F I have a very agreeable flight down to Sydney in 7:03 hours. I’m curious about the brand new regional SIA Business Class on board the Boeing 787-10, of which SIA has ordered 49 and which is operating only since the current 2018 summer schedule. Until 2019 they are due to replace the current 21 A330-300s which offer an outdated premium product with 2-2-2 configuration and only angled lie-flat seats. 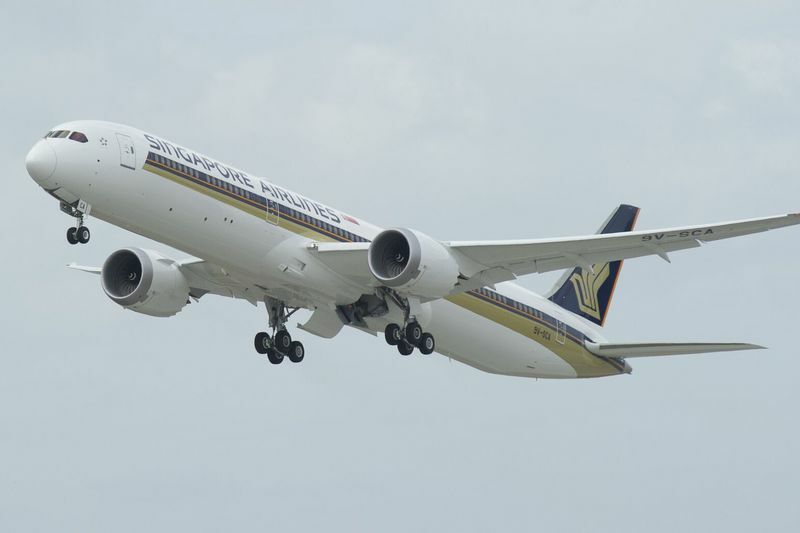 SIA’s regional routes can last between 45 minutes and eight hours of flying time, while on average these are three- to four-hour missions within Asia. 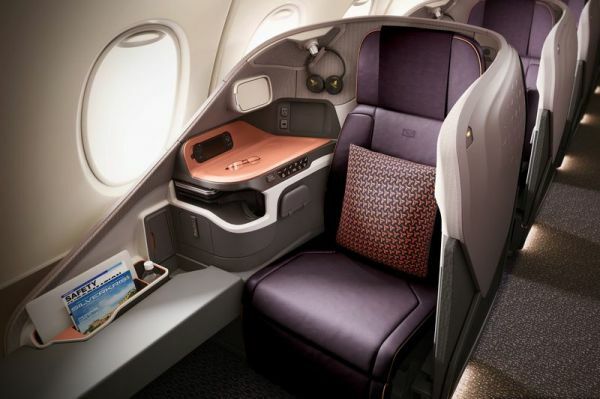 SIA’s 787s boast 36 Business Class compartments based on Stelia’s Solstys III seat, whose design here is branded as Symphony. A certain resemblance in appearance to the new A380 product is intended, the table monuments are almost identical, also the classy aubergine-coloured leather and the noise-absorbing textile cladding inside the suites. The seats are installed in a single cabin with nine rows of alternating 1-2-1 or 1-1-1-1 configuration at a pitch of 60’’ (152cm). The good news: Here all seats offer much more foot space than in the new A380 Business product. The extended bed is a bit shorter with 193cm, but there is no need to sleep diagonally. But there are different problems: The seat is very narrow, just 20’’ (51cm), just one inch wider than seats in SIA’s Premium Economy. 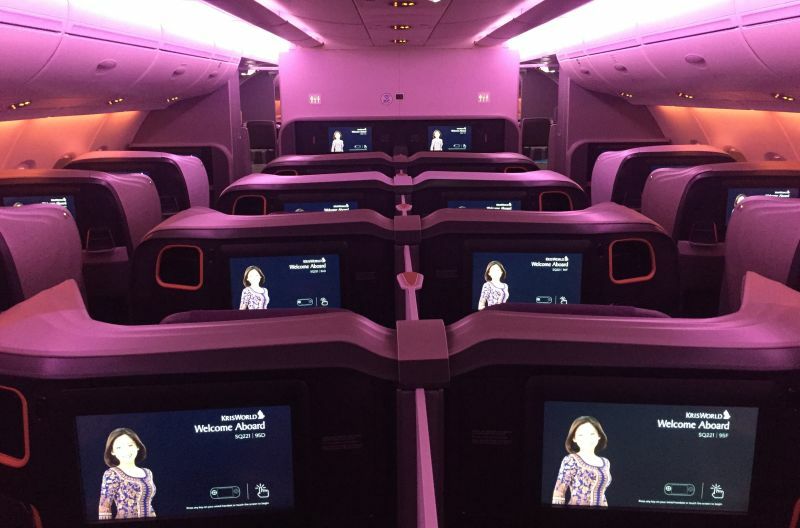 Otherwise SIA’s Business Class seats are 25 to 30’’ wide. In lowering the two smallish armrests the seat width can at least be extended to 26’’. Another bottleneck are the tables where they are installed as monuments towards the aisle and passengers have to squeeze through to get seated. On the eight window seats concerned the gap between table and the seat in front for example is only a tiny 23cm wide, very narrow for people who aren’t slim. The Boeing 787-10 offers two favourite seats, 11A and 11K, the window seats in the first row. With luck I scored 11A and I’m very happy here. Both seats offer a huge storage panel which fits perfectly for my cabin trolley bag. I would value this even more on a day flight. The intention of this panel is to take a baby basket. “Corner office” is what already emerged as a nickname among frequent flyers for these superior seats. Similar to the A380 also the 787 offers the opportunity to sit close to a travel companion in the mid-section and if so desired even install a kind of double bed. While on the A380 flight attendants can fully lower the divider, it still sticks out a bit on the 787, even in the lowest position. In the middle of the 787 you sit either very close together, nicknamed “honeymoon suite”, or far apart, separated by not one but two table monuments, called “divorce seats”. In any case, the flight time of just 4:55 hours from Perth to Singapore in the middle of the night is much too short for this very appealing product. Appealing especially taking into account it is only offered on shorter regional flights. 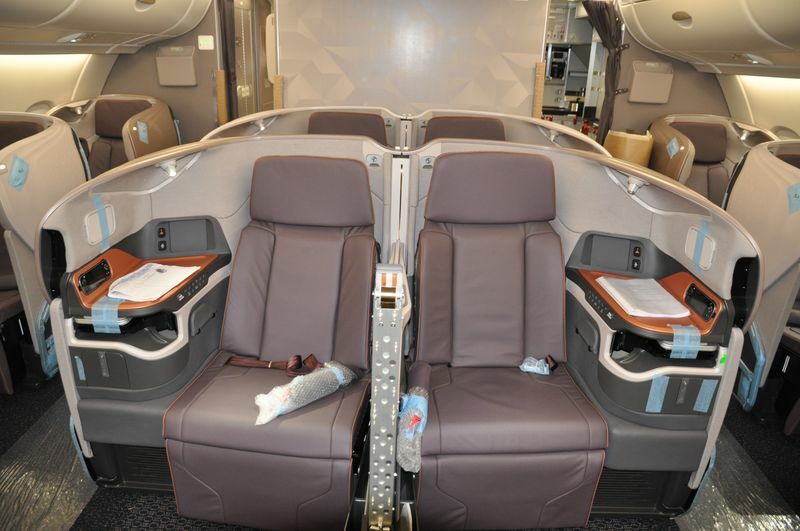 In general the constant product level of Singapore Airlines in Business Class is impressive. Both newest variants of this class are visual charmers. This, however, goes partially at the expense of comfort, most notably in the limited foot space in the A380, where cost reasons led to a much denser layout. Especially in this point, surprisingly, the regional product in the Boeing 787 offers more comfort. But even with such shortcomings, the product is still superior to that of many competitors.